Taif and Jeddah (approx. 7 hours drive one way), it took us a year and a half to finally make a trip but the wait was well worth it. Before I get into the details of how to get there and where to stay, let’s do a quick overview of the amazing facts about the place. If you want to know more, just ask uncle google you’ll find tons of details. Madain Saleh, literally translated as “The Cities of (Prophet) Saleh” is mentioned in the Holy Books of Quran and Torah. The Quran refers to People of Thamud as inhabitants of this area and mentions how these people were skillful in carving houses out of mountains (Chapter 26, Verse 149). It then goes on to talk about how they were specifically instructed not to harm a she-camel, which was sent to them as a Miracle from Allah, but they killed her and were subsequently perished (Chapter 26, Verse 156-158). Madain Saleh is believed to have been inhabited by the Nabatean people somewhere around the first century and was known by its ancient name, ‘Hegra’ or ‘Al-Hijr. The ruined city served as the second capital of the Nabatean Kingdom and is actually comparable to the better known capital of the Kingdom - Petra (Jordan). While Petra stays a popular tourist destination, especially after its appearance in the movie 'Indiana Jones and the Last Crusade', Madain Saleh which is about 500 km to the south of Petra, stays a relatively hidden archeological treasure. Many historians and archeologists even argue that Madain Saleh actually surpasses its more popular and more ‘crowded’ neighbor in terms of archeological value. Location:Madain Saleh is located at a distance of about 350km to the north-west of Madina. 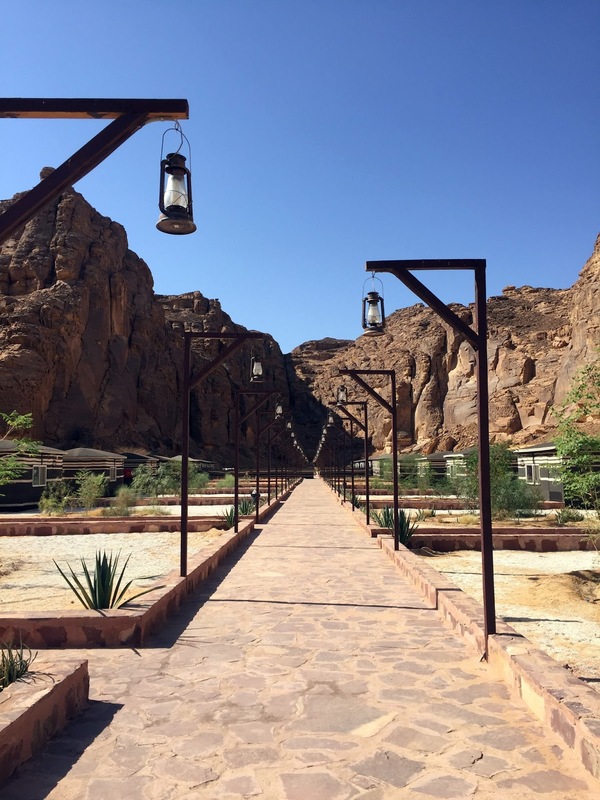 You cannot spend the night in Madain Saleh itself so all of the accommodations are located in the small town of Al-Ula, about 20km away. It took us approximately 4 hours to reach our campsite in Al-Ula from Madina. The highway was great so it was a smooth drive and we had no trouble getting there, thanks to google maps. You stay in really cool camps. Under the starry desert sky. 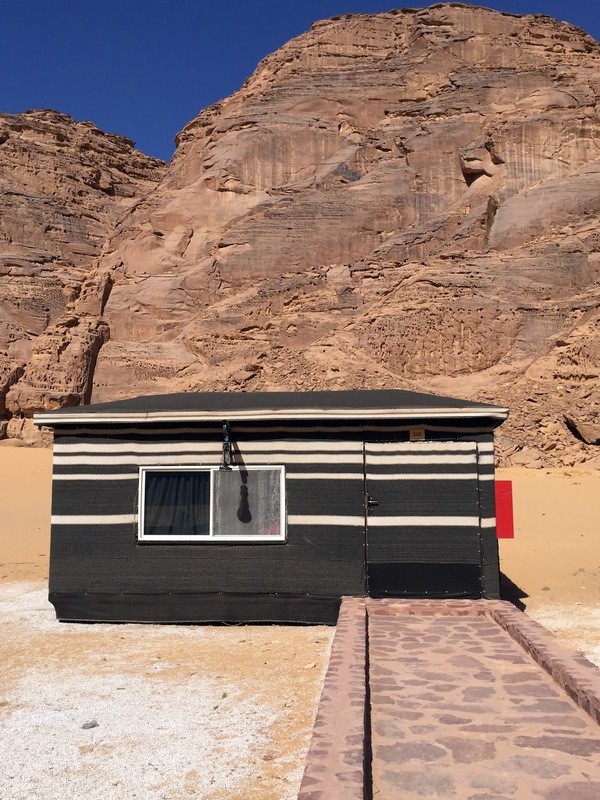 Though you might be able to find a couple of apartment hotels in Al-Ula, I would strongly advise AGAINST staying in those because it takes away from the entire experience. We stayed in Sahary Al-Ola Camp and loved our camp and the entire campsite. 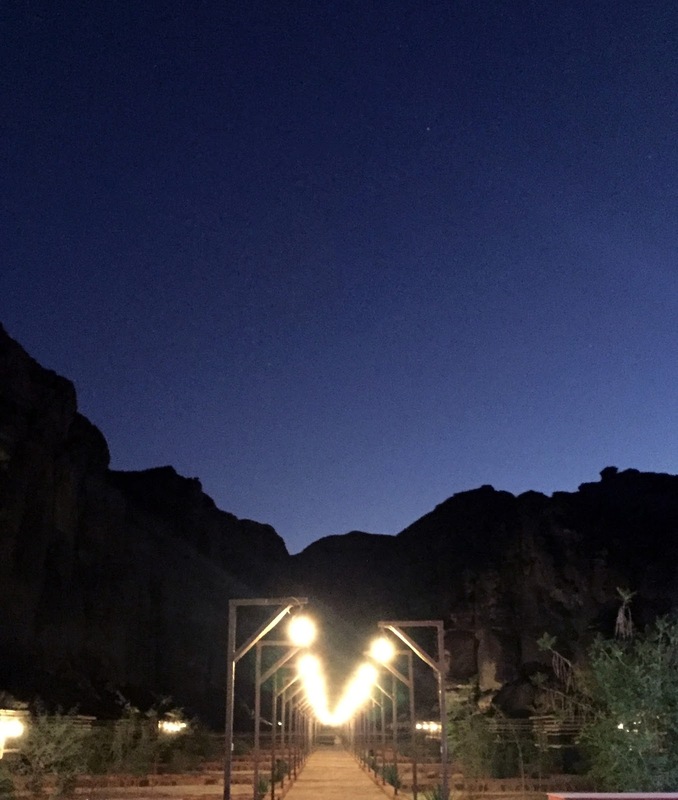 You have to get off the main highway going towards Al-Ula and take a path through the desert to reach the campsite which sits snug in the middle of rocky mountains, lit up with lanterns and ready to welcome its guests! The camp itself was spacious and the attached washroom was clean. Brownie points for a shower cabin and running hot water! I didn’t see any bugs inside the camp but saw a few out in the garden where we had dinner so it’s better to keep an insect repellant lotion/band on you, especially for kids. We had booked a Queen Bed which wasn’t available when we got there so we got a Twin Bed instead. They had a two seater sofa which I put next to my bed for Aleyan to sleep on. If you’re traveling with older kids, you can ask for additional mattresses for nominal extra charges but do call and check beforehand to be sure of availability. They also have suites for bigger families, yaas! The food was very average so don’t go with high expectations. They did have a bunch of dishes, pasta, shrimps, sautéed veggies, beef-something, rice-something, chicken-something, hummus and a variety of salads, but the taste was just okay-ish. You may opt out of the buffet and instead take the ~15minutes drive to Al-Ula city centre and grab something from a local restaurant. If all else fails, I can guarantee you a Kudu meal because that’s what we had the next day. The day we checked-in, the campsite was fully booked and there were a number of expats from European and other Middle Eastern countries. 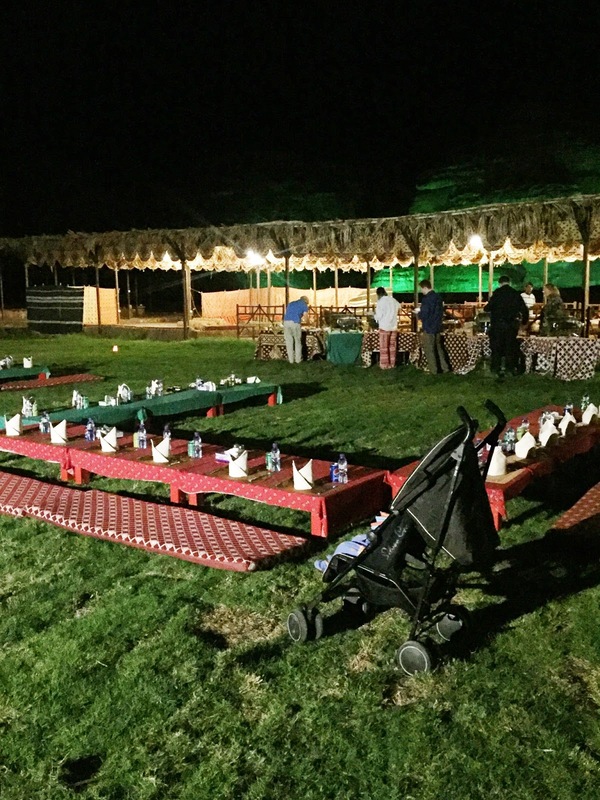 There is no abaya restriction and a lot of women were enjoying the bedouin style dinner setting in their pjs and t-shirts. There was also a place for bonfire and BBQ and if you’re traveling with a bigger group, you can probably talk to the management beforehand and request for a specific menu to be arranged for your group. The room cost us SAR 500 per night (breakfast included) + SAR 100/person for one buffet meal. The rates would obviously vary as per the season and availability. 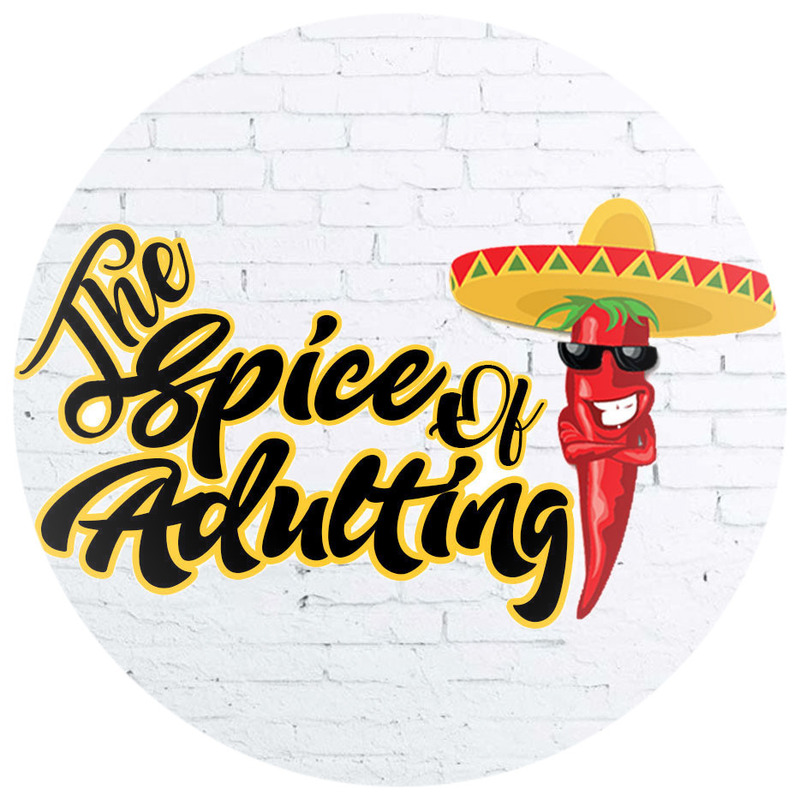 You can book Sahary Al-Ola (or any other place) using the below link and get a 10% refund after your stay (valid for first 10 people using the link). We reached the campsite post-sunset so we pretty much just walked around the place, had dinner and stayed in. The next morning we checked-out around noon and made our first stop at ‘Jabal Al Feel’ - The Elephant Mountain. It is around 15 minutes drive from Sahary Al Ola and was easy to locate on google maps, just search for ‘Elephant Mountain’ and it will show up. Once you get to the area, you can spot the mountain in an instant, the elephant is hard to miss. There is no historical significance of this place as such, it has absolutely no connection to Surah Feel, it's just a natural sandstone rock of magnanimous proportions which happens to be in the shape of an elephant. It looks great from a distance, definitely a must visit if you’re in the area. You can drive up close to it, get off the car for pictures and that’s about it. It’s better to go earlier in the day before the sun gets too harsh. If you’re traveling with a tour guide, they usually make the arrangements for the permit themselves. Once you’re past the check post, you’ll see a train engine to your right that belongs to Hejaz Railways which was completed in 1908 to transport pilgrims from the Damascus through Syria to Madina. It was one of the principal railroads of the Ottoman empire with Madain Saleh being one of the most important stations. There is now a small railway museum right next to the train. Past the train, you can choose one of the two routes to drive through the sites of Madain Saleh. The tombs are located far and wide and cover an expansive area so it is best to drive through, walking through the place is really not a great idea and there is no third option. The sites are marked with information boards which provide brief overview of each landmark. 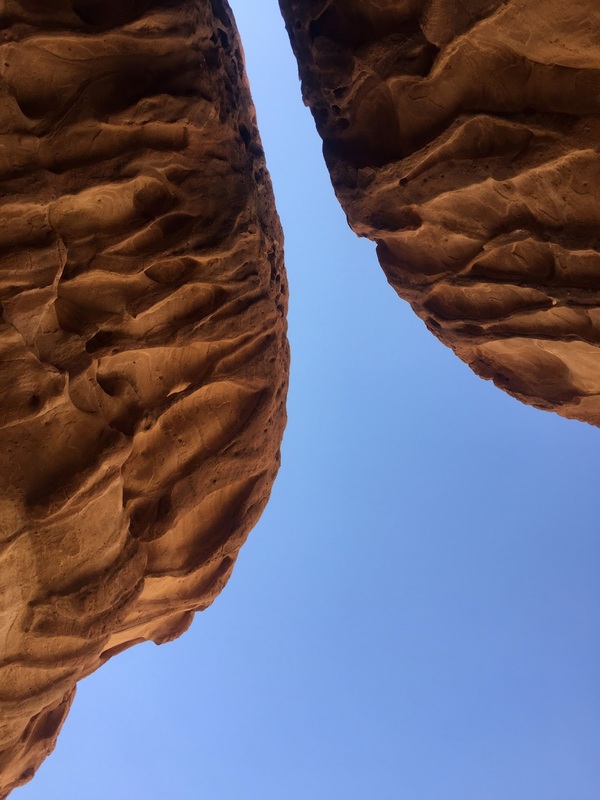 It is said that the Nabateans used to believe in life after death and they made their own tombs during their lifetime with the rectangular sections (as can be seen in the picture below) for their souls to reside in. October - December are the best months to visit Madain Saleh in terms of weather. Since it's essentially an expanse of desert, the sun is harsher in the summer months and getting out of the car to visit the tombs won’t be convenient. We visited in early October and the weather was fairly pleasant. The sun wasn’t unbearable and it was surprisingly windy, just enough to make your hair blow, not enough to get the sand blowing. Qasar-e-Farid - The biggest of them all, four-storey high! Remember to put on generous amounts of sunblock and wear closed shoes to walk around easily. You can drive up close to the sites and then get off and walk around wherever you want. Our journey back was a straight 7 and half hour drive, with two 10-15 minute breaks, from Madain Saleh to Jeddah. You may also choose to stop at Madinah on the way back and break the journey. Visiting places with such a strong historical background becomes all the more enjoyable if you’ve read up on the history before taking the trip. Being a Muslim, my perspective of the place was majorly defined by the story of Prophet Saleh(a.s) and throughout our drive, I was constantly thinking about how this place once witnessed the Wrath of Allah and an entire nation was wiped off. We should always recite ‘astaghfar’ while visiting such places, make it a point to take lesson and use it as an opportunity to renew and refresh our belief in the Ultimate Power. I love your blog !! And already planning to visit with my husband and Burhan. InshAllah. Looking forward. Hope you guys have a great time when you go !